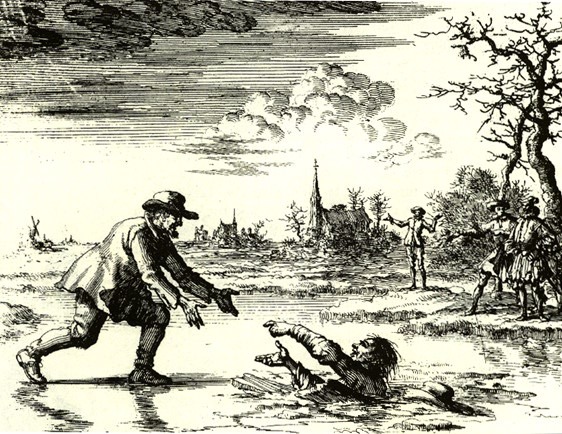 No story of an Anabaptist martyr has captured the imagination more than the tale of Dirk Willems. Dirk was caught, tried and convicted as an Anabaptist in those later years of harsh Spanish rule under the Duke of Alva in The Netherlands. He escaped from a residential palace turned into a prison by letting himself out of a window with a rope made of knotted rags, dropping onto the ice that covered the castle moat. Seeing him escape, a palace guard pursued him as he fled. Dirk crossed the thin ice of a pond, the “Hondegat,” safely. His own weight had been reduced by short prison rations, but the heavier pursuer broke through. Hearing the guard’s cries for help, Dirk turned back and rescued him. The less-than-grateful guard then seized Dirk and led him back to captivity. This time the authorities threw him into a more secure prison, a small, heavily barred room at the top of a very tall church tower, above the bell, where he was probably locked into the wooden leg stocks that remain in place today. Soon he was led out to be burned to death. Some inhabitants of present-day Asperen, none of them Mennonite, regard Dirk as a folk hero. A Christian, so compassionate that he risked recapture in order to save the life of his drowning pursuer, stimulates respect and memory. Recently Asperen named a street in Dirk’s honor. John S. Oyer and Robert Kreider, Mirror of the Martyrs [Good Books, 1990], p. 36-37.